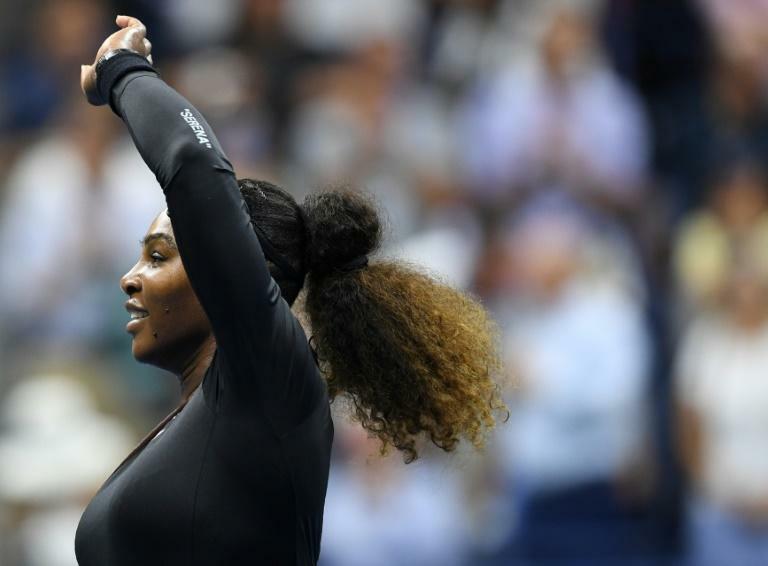 Serena Williams is taking nothing for granted as she heads into the US Open semi-finals on Thursday with a record-equalling 24th Grand Slam title on the horizon. "I'd been a couple of steps away at the last Grand Slam, so I'm definitely not ahead of myself," said Williams, who fell to Angelique Kerber in the Wimbledon final in July. "I still know that no matter whether I'm in the semi-finals or the finals, I have a really long way to go to win that. "That proved to be true at Wimbledon. I'm just taking it one at a time -- literally." Williams booked her last-four spot with a 6-4, 6-3 victory over eighth-seeded Czech Karolina Pliskova. The win came in her 100th match on Arthur Ashe Stadium, where she won the first of her six US Open titles in 1999. She avenged a semi-final loss to Pliskova in the 2016 US Open and notched her first win over a top-10 player since she returned in March after the birth of daughter Olympia in September of last year. "Shocking, my first top-10 win," said Williams, who will face Anastasija Sevastova for the first time for a place in the final after the 19th seeded Latvian knocked out defending champion Sloane Stephens, the world number three. They will kick off the action on Ashe at 7 pm (2300 GMT), with 14th seeded Madison Keys of the United States taking on 20th-seeded Naomi Osaka of Japan in the second semi-final. The departures of Stephens and Pliskova left Keys and Williams -- seeded 17th despite her world 26 ranking -- as the highest seeds remaining in the women's draw. Keys, runner-up to Stephens last year, returned to the last four with a 6-4, 6-3 victory over Spain's Carla Suarez Navarro. She'll face 20-year-old Naomi Osaka, who became the first Japanese woman in 22 years to reach a Grand Slam semi-final with a 6-1, 6-1 victory over Lesia Tsurenko. Keys has won all three of their prior meetings, including a 2016 US Open third-round match in which the American rallied to win the third set in a tiebreaker. This year Keys got the better of Osaka in the third round of the French Open. Pliskova, who seized the world number one ranking herself briefly last year, said that even though Williams is still rebuilding her world ranking, she's playing more like her old number one self than a number 17. "She's playing with the same power. She can still serve well," Pliskova said. "I don’t think there's any change with her game. She's just going for her shots." That's good news for the 36-year-old Williams as she vies for a title that would see her break out of a tie with Chris Evert for most US Open victories and equal Australian Margaret Court's all-time record of 24 major titles. While she says she doesn't feel pressure, she admits that she savors every opportunity more now. "I don't think I have another 10 years of having opportunities to be able to play and win championships," Williams said. "Every match really means a lot to me."